Greetings everyone! Today I have a really cute Etsy shop to share with you guys, called Myrtle Made It. It's UK based, as is the case with the majority of the shops that I feature. Myrtle Made It is a relatively new Etsy shop, only having been open for a couple of weeks. It specialises in felt flowers and indoor wreaths which incorporate felt flowers. 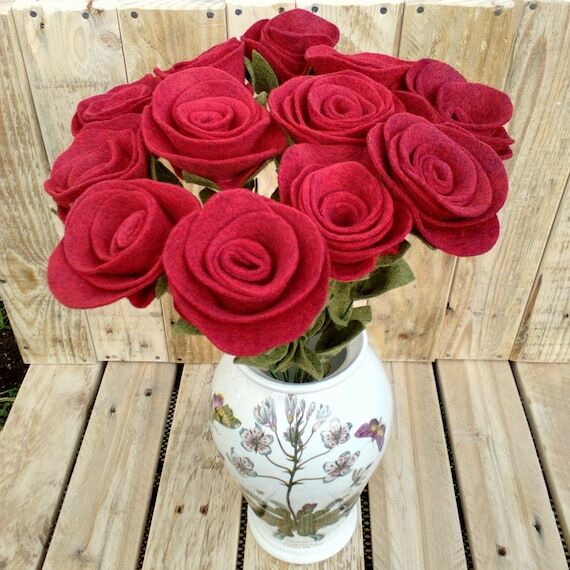 As Valentines Day is coming up, there are some lovely red felt roses available and I've been lucky enough to get my hands on some. Inside the box was a lovely bouquet wrapped in orange tissue paper. The bouquet itself is also wrapped in patterned paper and some hessian which is secured with a wooden heart. One of the reasons that I like to choose Etsy sellers over shopping on the high street is that the attention to detail with packaging is always spot on. It's so lovely to open a package where everything has been thought out and presented beautifully. The roses themselves look just like the photos. They really are gorgeous and I'd love to receive these as a gift for Valentines Day - they're just as pretty as real roses and they will never die which is a definite bonus. All the pieces of the flowers are secured in place well and there's plenty of wire for the stem so they can be cut down to your desired length or kept long if you want them to be taller. I'm so pleased with my little package from Myrtle Made It - the roses are beautiful and my order was definitely packaged with love.